Store special treasures and commemorate the place you hold dear with Charlotte Guptill's design. A sea shell from your favorite beach. The necklace your spouse gave you on your honeymoon. Store keepsakes and commemorate the place you hold dear with this sentimental box. Charlotte Guptill's porcelain design features a miniature map of your special location. 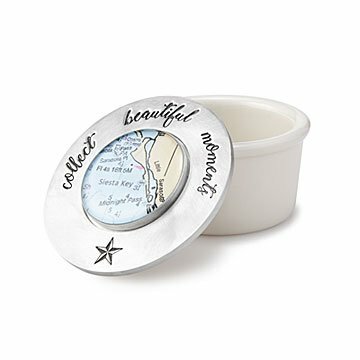 The pewter top reminds you to "collect beautiful moments," throughout your life. A sweet wedding or birthday gift, it reminds loved ones of the unique place they treasure. Handmade in Maine. Our Satin finish Lead Free Pewter is designed to patina slowly and evenly. Developing a soft warm patina is often considered an enhancement to appearance. If desired, apply and rub a mild detergent on psurface, rinse under running water and gently wipe dry with a soft cloth. I can't wait to see her eyes light up.